UPDATE: WINNER IS KIM FARDAD & FAMILY! Thank you all for entering! We have a great family release that you all are familiar with from The Weinstein Company and Anchor Bay Entertainment, coming out just in time for Thanksgiving! It is this summer’s SPY KIDS: ALL THE TIME IN THE WORLD, starring Jessica Alba, Joel McHale and Jeremy Piven. It comes out on tomorrow on DVD in stores near you and one lucky family will win this DVD by entering a comment below in the “reply to” section! Just let Hollywood Mom Blog know why you want this DVD and you’re entered to win! ABOUT SPY KIDS: The action packed franchise is back…with the next generation of Spy Kids! Marissa Cortez Wilson (Jessica Alba) has it all: married to a famous spy-hunting television reporter (Joel McHale), with a new baby and intelligent twin step kids, Rebecca (Rowan Blanchard) and Cecil (Mason Cook). When maniacal Timekeeper (Jeremy Piven) disrupts her domestic bliss—threatening to take over the planet—Marissa comes out of retirement as a top secret agent. With Armageddon quickly approaching, Rebecca and Cecil are thrust into action! 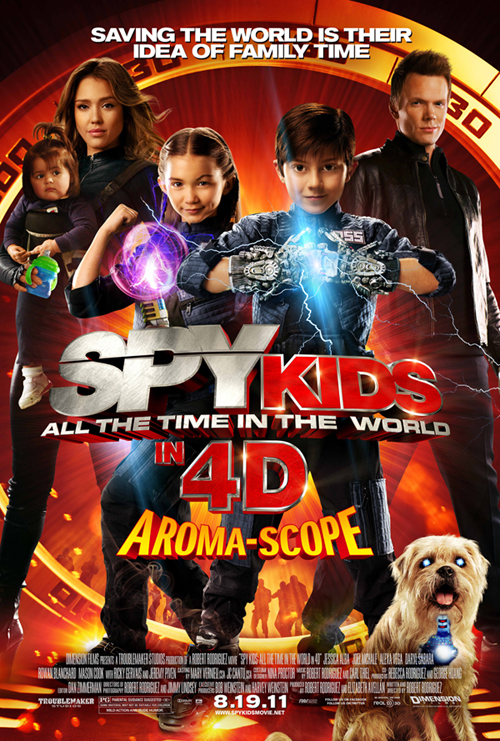 With a little help from some familiar Spy Kids friends, Carmen (Alexa Vega), Juni (Daryl Sabara), and their faithful dog Argonaut (Ricky Gervais) and some mind-blowing gadgets, they just may be able to save the world! My kids were hoping to see this when it first came out, but due to being sick, they had to miss it. They would be thrilled to finally get a chance to see the movie they were so very much looking forward to seeing. We love the Spy Kid Series. We have seen them all but this one. Othel watches the Spy Kids movies over and over. This past summer was so busy for us with our older relatives being sick. By the time we had free time, the movie had left the theatre. We hope to see it now that it is coming out on DVD. My son the super spy (I’d tell you his name, but then I’d have to kill you) would love to own this movie. After seeing it in the theater, he came home to try to enlist our dog in spy pet academy, a fruitless effort so far, but fun to watch. Happy Thanksgiving! We went as a family to watch this movie and I cried in it. We went back several more times because the kids loved it di much & again I cried. This movie wasn’t just for kids it was for adults too. I love this movie. We have not seen the series however my twins were in acting classes for a year with Mason Cook (Cecil). He is not in the acting classes anymore since he moved to LA when he got the role in Spy Kids. We see him occasionally at auditions but the twins would love to watch him in the movie (especially after being in class with him). My kids just love all of the Spy Kids Movies. We have all of the other movies on dvd. They watch them so much we actually had to buy a second set of them all. I would love to win this for my daughter , for her stocking this year.. I think she would enjoy this movie. @Sheri – As a close relative of Mason Cook, I know first-hand that he has never taken a single acting class. And, he was already living in Los Angeles well before accepting the role of Cecil in Spy Kids. I posted this comment to ensure that any public information concerning Mason is accurate. Perhaps you have him confused with someone else.